These diapers come with a pair of non-metal silicone SafetyB pins to hold them in place and adjust the tightness according to the baby’s weight. These pins are specifically designed to hold the muslin diapers without posing any poking dangers to the baby. These pins should be stored away from the baby as they are small and pose a choking hazard. Each pack contains 3 newborn muslin diapers and 2 silicone pins. These diapers are made from 100% organic unbleached muslin fabric that is soft against the baby’s delicate skin. These diapers are specifically for newborn babies upto 3 months of age. They have an umbilical cord snap down for the first week of baby’s life till the stump falls off. These diapers are pure cotton hence would require waterproof covers, however we recommend not using covers as that would allow air to pass. Without any waterproof covers these diapers will hold (wet only) for upto 1.5 hours These diapers come with a pair of non-metal silicone SafetyB pins to hold them in place and adjust the tightness according to the baby’s weight. These pins are specifically designed to hold the muslin diapers without posing any poking dangers to the baby. These pins should be stored away from the baby as they are small and pose a choking hazard. 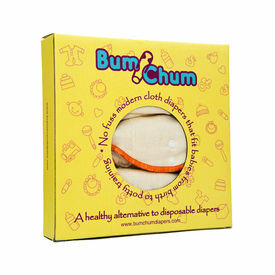 Each pack contains 3 newborn muslin diapers and 2 silicone pins.